سمرقندی, محمد رضا, شعبانلو, امیر, نظری, الهام, صدری, محبوبه, مهرعلی پور, جمال. (1395). بررسی کارایی فرایند الکتروپرسولفات در تخریب غلظت‌های بالای آنتی‌بیوتیک سفتریاکسون از پساب‌های دارویی. مجله آب و فاضلاب, 27(4), 15-25. محمد رضا سمرقندی; امیر شعبانلو; الهام نظری; محبوبه صدری; جمال مهرعلی پور. "بررسی کارایی فرایند الکتروپرسولفات در تخریب غلظت‌های بالای آنتی‌بیوتیک سفتریاکسون از پساب‌های دارویی". مجله آب و فاضلاب, 27, 4, 1395, 15-25. 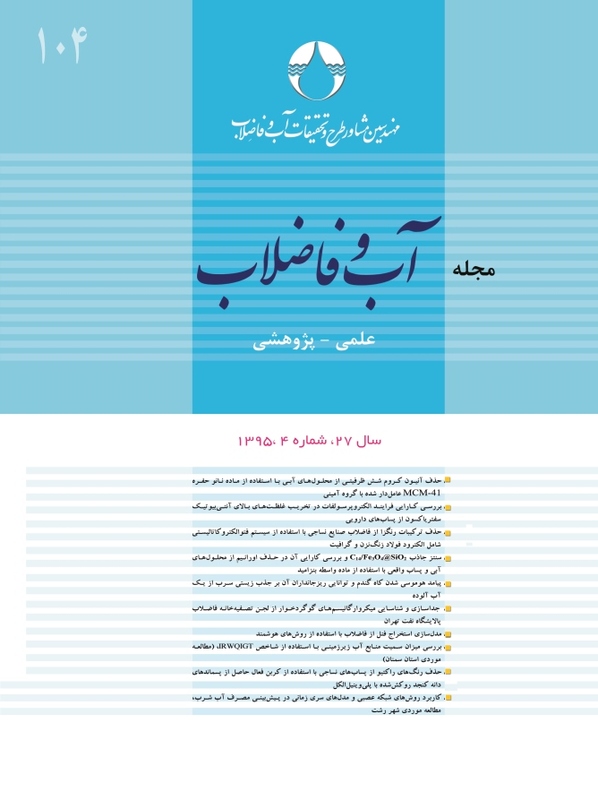 سمرقندی, محمد رضا, شعبانلو, امیر, نظری, الهام, صدری, محبوبه, مهرعلی پور, جمال. (1395). 'بررسی کارایی فرایند الکتروپرسولفات در تخریب غلظت‌های بالای آنتی‌بیوتیک سفتریاکسون از پساب‌های دارویی', مجله آب و فاضلاب, 27(4), pp. 15-25. سمرقندی, محمد رضا, شعبانلو, امیر, نظری, الهام, صدری, محبوبه, مهرعلی پور, جمال. بررسی کارایی فرایند الکتروپرسولفات در تخریب غلظت‌های بالای آنتی‌بیوتیک سفتریاکسون از پساب‌های دارویی. مجله آب و فاضلاب, 1395; 27(4): 15-25. استفاده از یون‌های دو ظرفیتی آهن یکی از روش‌های فعال‌سازی آنیون پرسولفات است. هدف از این پژوهش، فعال‌سازی الکتریکی آنیون پرسولفات و بررسی کارایی فرایند در تجزیه آنتی‌بیوتیک سفتریاکسون از پساب‌های سنتتیک دارویی بود. در این پژوهش، از یک راکتور منقطع به حجم مفید 1 لیتر، مجهز به الکترودهای آهن متصل به دستگاه تولید جریان مستقیم استفاده شد. تأثیر پارامترهای pH، ولتاژ، غلظت پرسولفات و غلظت اولیه سفتریاکسون بر کارایی فرایند سنجیده شد. میزان خوردگی الکترودها، اثرات هم‌افزایی پارامترها، تعیین سینتیک واکنش و میزان حذف COD بررسی شد. نتایج نشان داد پارامترهای اشاره شده تأثیر چشمگیری بر کارایی دارند، کارایی فرایند در شرایط pH برابر 3، ولتاژ10 ولت، غلظت پرسولفات 50 میلی‌مول در لیتر و غلظت اولیه سفتریاکسون 18/0 میلی‌مول در لیتر در مدت زمان 45 دقیقه، 96 درصد تعیین شد. با تغییر پارامترها از حالت بهینه، کارایی فرایند کاهش یافت. کارایی فرایند در حذف COD در مدت زمان بهینه، 72 درصد بود. همچنین سینتیک فرایند درجه یک بود. بهره‌گیری از فرایند الکتریکی در راستای فعال‌سازی آنیون پرسولفات دارای مزایای عمده مانند کاهش مصرف آهن دو ظرفیتی و دستیابی به کارایی بالا در حذف آنتی‌بیوتیک است. این روش می‌تواند به‌عنوان یک روش جایگزین برای تصفیه آلاینده‌های مقاوم و کاهش آلودگی‌ها باشد. Two-valent iron ions can be used to activate persuphate anions. The objective of the present study was to investigate the electrical activation of persuphate anions and to determine the efficiency of electro-persulphate in the removal of ceftriaxone antibiotic from synthetic pharmaceutical effluents. For this purpose, a reactor (with an effective volume of 1 L) equipped with iron electrodes connected to a DC power supply was used and the effects of pH, voltage, persulphate content, and ceftriaxone initial concentration on the efficiency of the process were studied. Moreover, electrode corrosion, synergistic effects of the parameters studied, reaction kinetics, and chemical oxygen demand (COD) removal were studied. Results showed that the variables had a significant effect on process efficiency such that 96% of the ceftriaxone in the effluent was removed under the following optimum conditions: pH: 3, voltage: 10 V, a persulphate concentration of 50 mM/L, a ceftriaxone initial concentration of 0.18 mM/L, and a reaction time of 45 min. However, removal efficiency declined when the above conditions changed. It was also observed that COD removal was 72% in the optimum reaction time. Moreover, the process kintetics was found to be a first-order one. Application of an electrical process to active persulphate anion is assoiated with such advantages as reduced iron consumption and high antibiotic removal efficiency. Based on the results obtained, the proposed method may be recommended as an alternative for treating persistent pollutants to reduce environmental pollution. 1. Homem, V., and Santos, L. (2011). “Degradation and removal methods of antibiotics from aqueous matrices–A review.” J. of Environmental Management, 92(10), 2304-2347. 2. Magureanu, M., Piroi, D., Mandache, N.B., David, V., Medvedovici, A., Bradu, C., and Parvulescu, V.I. (2011). “Degradation of antibiotics in water by non-thermal plasma treatment.” J. Water Research, 45(11), 3407-3416. 3. Dimitrakopoulou, D., and Rethemiotaki, I., Frontistis, Z., Xekoukoulotgakis, N.P., Veniem, D., and Mantzavinos, D. (2012). “Degradation, mineralization and antibiotic inactivation of amoxicillin by UV-A/TiO2 photocatalysis.” J. of Environmental Management, 98,168-1674. 4. Jeong, J., Song, W., Cooper, W.J., Jung, J., and Greaves, J. (2010). “Degradation of tetracycline antibiotics: Mechanisms and kinetic studies for advanced oxidation/reduction processes.” J. Chemosphere, 78(5), 533-540. 5. Cho, J.Y. (2010). “Evaluation of degradation of antibiotic tetracycline in pig manure by electron beam irradiation.” Bulletin of Environmental Contamination and Toxicology, 84(4), 450-453. 6. Peterson, J.W., Petrasky, L.J., Seymour, M.D., Burkhart, R.S., and Schuiling, A.B. (2012). “Adsorption and breakdown of penicillin antibiotic in the presence of titanium oxide nanoparticles in water.” J. Chemosphere, 87(8), 911-917. 7. Xian, Q., Hu, L., Chen, H., Chang, Z., and Zou, H. (2010). “Removal of nutrients and veterinary antibiotics from swine wastewater by a constructed macrophyte floating bed system.” J. of Environmental Management, 91(12), 2657-2661. 8. Xu, W., Zhang, G., Zou, S.-Ch., Li, X.-D., and Liu, Y.-Ch. (2007). “Determination of selected antibiotics in the Victoria Harbour and the Pearl river, South China using high-performance liquid chromatography-electrospray ionization tandem mass spectrometry.” J. Environmental Pollution, 145(3), 672-679. 9. Mompelat, S., Le Bot, B., and Thomas, O. (2009). “Occurrence and fate of pharmaceutical products and by-products, from resource to drinking water.” J. Environment International, 35(5), 803-814. 10. Hernando, M.D., Mezcua, M., Fernandez-Alba, A.R., and Barcelo, D. (2006). “Environmental risk assessment of pharmaceutical residues in wastewater effluents, surface waters and sediments.” Talanta, 69(2), 334-342. 11. Carabineiro, A., Thavorn-Amornsri, T., Pereira, M.F.R., and Figueiredo, J. L. (2011). “Adsorption of ciprofloxacin on surface-modified carbon materials.” J. Water Research, 45, 4583-4591. 12. Matilainen, A., and Sillanpää, M. (2010). “Removal of natural organic matter from drinking water by advanced oxidation processes.” J. Chemosphere, 80(4), 351-365. 13. El-Desoky, H.S., Ghoneim, M.M., El-Sheikh, R., and Zidan, N.M. (2010). “Oxidation of Levafix CA reactive azo-dyes in industrial wastewater of textile dyeing by electro-generated Fenton's reagent.” J. Hazardous Materials, 175(1), 858-865. 14. Rosales, E., Sanromán, M., and Pazos, M. (2012). “Application of central composite face-centered design and response surface methodology for the optimization of electro-fenton decolorization of Azure B dye.” J. Environmental Science and Pollution Research, 19(5), 1738-1746. 15. Waldemer, R.H., Tratnyek, P.G., Johnso, R.L., and Nurmi, J.T. (2007). “Oxidation of chlorinated ethenes by heat-activated persulfate: Kinetics and products.” J. Environmental Science and Technology, 41(3), 1010-1015. 16. Wang, W.H., Hoag, G.E., Colins, J. B., and Naida, R. (2013). “Evaluation of surfactant-enhanced in situ chemical oxidation (S-ISCO) in contaminated soil.” J. Water, Air, and Soil Pollution, 224 (12), 1-9. 17. Zhou, L., Zheng, W., (2013). “Ferrous-activated persulfate oxidation of arsenic (III) and diuron in aquatic system.” Journal of Hazardous Materials, 263, 422-430. 18. Gu, Z.Y., Zhong, Z., Qiu, Z., Sun, F.C., and Zhang, Z.L. (2013). “Potential for persulfate degradation of semi volatile organic compounds contamination.” J. Advanced Materials Research, 651, 109-114. 19. Sohrabi, V., Ross, M. S., Martin, J.W., and Barker, J.F. (2013). “Potential for in situ chemical oxidation of acid extractable organics in oil sands process affected groundwater.” Chemosphere, 93(11), 2698-2703. 20. Romero, A., Santos, A., Cicente, F., and Gonzalez, C. (2010). “Diuron abatement using activated persulphate: Effect of pH, Fe(II) and oxidant dosage.” J. Chemical Engineering, 162(1), 257-265. 21. Jiang, X., Wu, Y., Wang, P., Li, H., and Dong, W. (2013). “Degradation of bisphenol a in aqueous solution by persulfate activated with ferrous ion.” J. Environmental Science and Pollution Research, 20 (7), 4947-4953. 22. Hussain, I., Zhang, Y., Huang, S., and Du, X. (2012). “Degradation of p-chloroaniline by persulfate activated with zero-valent iron.” Chemical Engineering Journal, 203, 269-276. 23. Fang, G-D., Dionysiou, D.D., Wang, Y., Al-Abed, S., and Zhou, D.M. (2012). “Sulfate radical-based degradation of polychlorinated biphenyls: Effects of chloride ion and reaction kinetics.” J. Hazardous Materials, 227, 394-401. 24. Ahmad M., Teel, A.L., and Wattes, R.J. (2013). “Mechanism of persulfate activation by phenols.” J. Environmental Science and Technology, 47(11), 5864-5871. 25. Oh, S-Y., Kang, S-G., and Chiu, P.C. (2010). “Degradation of 2,4-dinitrotoluene by persulfate activated with zero-valent iron.” J. Science of the Total Environment, 408(16), 3464-3468. 26. Wu, J., Zhang, H., and Qium, J. (2012). “Degradation of acid orange 7 in aqueous solution by a novel electro/Fe2+/peroxydisulfate process.” J. Hazardous Materials, 215-216,138-145. 27. Ji, Y., Ferronato, C., Salvador, A., Yang, X., and Chovelon, J.M. (2014). “Degradation of ciprofloxacin and sulfamethoxazole by ferrous-activated persulfate: Implications for remediation of groundwater contaminated by antibiotics.” J. Science of the Total Environment, 472, 800-808. 28. Liang, C., Wang, Z-S., and Bruell, C.J. (2007). “Influence of pH on persulfate oxidation of TCE at ambient temperatures.” J. Chemosphere, 66(1),106-113. 29. Zhao, W., Zhang, Y., and Li, Q. (2008). “Indirect spectrophotometric determination of sodium ceftriaxone with n-propyl alcohol-ammonium sulfate–water system by extraction flotation of copper (II).” J. Clinica Chimica Acta, 391(1), 80-84. 31. Xu, H., Yang Z-H.I., Zeng, G.M., Luo, Y.L., Huang, J., Wang, L.K. Song, P.P., and Mo, X. (2014). “Investigation of pH evolution with Cr (VI) removal in electrocoagulation process: Proposing a real-time control strategy.” J. Chemical Engineering, 239, 132-140. 32. Secula, M.S., Cagnon, B., de Oliveria, T.F., Chedeville, O., and Fauduet, H. (2012). “Removal of acid dye from aqueous solutions by electrocoagulation/GAC adsorption coupling: Kinetics and electrical operating costs.” J. Taiwan Institute of Chemical Engineers, 43(5), 767-775.